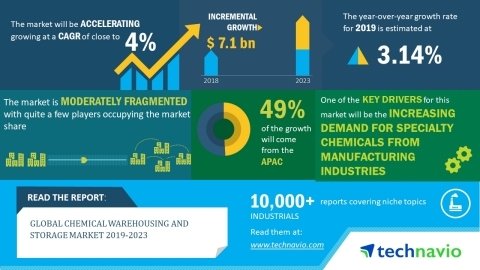 The global chemical warehousing and storage market is expected to post a CAGR close to 4% during the period 2019-2023, according to the latest market research report by Technavio. The consumption of specialty chemicals is witnessing substantial growth, especially in the pulp and paper, agriculture, textile, paints and coatings, personal care, food and beverage, and construction industries. The increasing global industrialization and the flourishing end-user industries are encouraging the distribution and logistics of specialty chemicals, which also involves warehousing and storage. The growing demand for specialty chemicals from manufacturing sectors and their rising distribution are expected to propel the need for warehousing and storage services during the forecast period. As per Technavio, the use of drones in warehouse management will have a positive impact on the market and contribute to its growth significantly over the forecast period. This global chemical warehousing and storage market 2019-2023research report also analyzes other important trends and market drivers that will affect market growth over 2019-2023. Warehouses perform a physical inventory check, which demands the need to halt operations. It is difficult to check and monitor inventory manually in high-volume warehouses and to avoid this, manufacturers have developed systems that use drones to scan inventories at warehouses. This prevents mismatches and helps warehouse operators in quickly locating products. Drones are equipped to read radio-frequency identification (RFID) tags which makes it easy to reduce inventory losses and misplacing and increases the efficiency of warehouse operators. The use of drones is expected to positively influence the growth of the global chemical warehousing and storage market during the forecast period. “The increasing demand for commodity chemicals and specialty chemicals, especially from countries such as China, Japan, South Korea, India, and Australia, is expected to influence the distribution and warehousing market. The growing market potential owing to the increasing spending capability is attracting investment from chemical warehousing and storage facilitators,” says a senior analyst at Technavio. This market research report segments the global chemical warehousing and storage market by type (general warehouse and specialized warehouse) and geographical regions (APAC, Europe, MEA, North America, and South America). The APAC region led the market in 2018, followed by North America, Europe, South America, and MEA respectively. During the forecast period, the APAC region is expected to continue its market dominance as well as register the highest incremental growth because of the rise in the production and consumption of chemical products.